Editors Note: A photo is included with this Press Release. With the Vancouver Olympics just around the corner, the world's #1 skate care company has had a busy month. 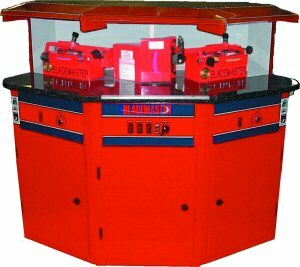 Chatham, Ontario based Blademaster has designed and manufactured skate sharpening and related equipment for teams that will compete at the 2010 Olympic games. Blademaster has been the official supplier to Hockey Canada since 2001. "With Hockey Canada's national teams traveling the world and competing against the best, it is imperative that our teams have the best equipment available to us," said Johnny Misley, Hockey Canada's executive vice-president of hockey operations. "Skating is the core to Team Canada's success and we rely on Blademaster machines to provide our teams with the best skate sharpening technology available in the marketplace." Blademaster is also the exclusive supplier to Team USA. According to Mike Bertsch, Assistant Executive Director, Marketing & Communications for USA Hockey, "Their top-of-the-line products and services are a huge asset to our organization." "We are pleased to supply the world's elite hockey programs with the best equipment in the world", says John Mariconda, Blademaster's Director of Marketing. "We are a global company and we have created a level playing field as far as skate care, by providing so many National Teams with our equipment". While some teams will rely on the Blademaster equipment that has served them well in the past, other teams have ordered new equipment specifically for use in Vancouver. "Our equipment has already been shipped as the International teams will be arriving soon." BLADEMASTER machines including the 'Ultimate' pictured here are made by Chatham Ontario-based Blademaster. They are used by NHL teams and will be used at the 2010 Olympic Winter Games in Vancouver.